The seats I currently have in my car are of the brace-against-the-door-while-cornering variety, and this has put me on a hunt for cool old vintage racing seats as replacements. This search has brought me to the rarer-than-rare ‘Paddy Hopkirk Carrera Recliners,’ possibly the best seats that can be put in a car. 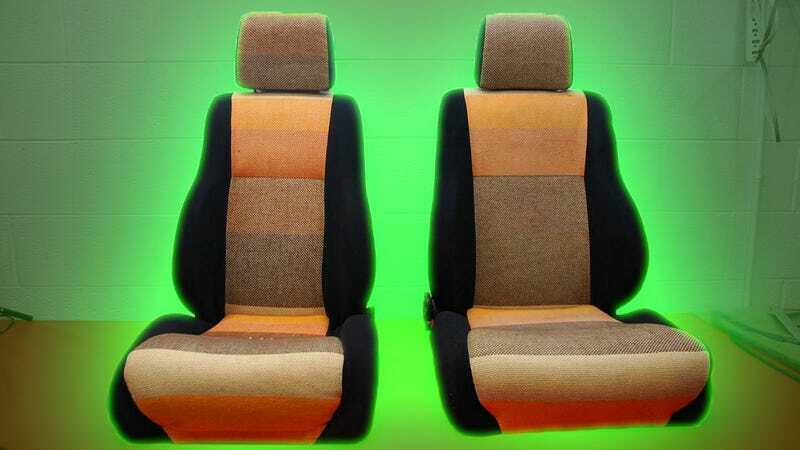 It’s difficult to track down information on these seats as they’re quite rare and most of the posts discussing them online are from mid-2000s British Mini forums. Now, that shouldn’t be a problem, but these forums are written mostly in cockney rhyming slang and are mostly filled with discussions of clotted cream and bovril. Readability is on the low side. However, after accosting a British man on the street (they are easy to spot: look for anyone wearing tweed) and forcing him to translate for me, I believe that I have parsed the origin of these fine car accessories. Paddy Hopkirk was an Irish rally driver, or better, he was a legendary Irish rally driver, the man who took Mini to its historic first overall win at the Monte Carlo Rally back in 1964. It was in this race that Hopkirk won the rally by capturing a shipment of gold in Italy that—wait, wrong Minis. In any case, Hopkirk was a racing icon back in the ‘60s and he didn’t waste any opportunity to capitalize on that fame. He had his name slapped on all kinds of products, from gas pedals to roof racks. He also had his own commemorative sport seat, called the Paddy Hopkirk Carrera Recliner. I found these ad pages on a number of locked-out forums. It looks very much like a vintage Recaro racing seat, and I assumed that this was an ultra-rare Recaro seat itself. Nah! That would be insufficiently obscure. I prodded my captive British translator for information using a rolled-up poster of the Queen and he directed me to this forum page that is locked behind a log-in screen but visible using Google image search. It shows an advertisement for the Paddy Hopkirk Carrera Recliner from ‘Top Quality Terry Hunter Seats.’ A quick search after that (and a brief pause to dry my translator’s tears) revealed that Terry Hunter Ltd. based out of London made fiberglass-backed seats and claimed to have made the seats that were in factory-backed Mini rally cars at the time. The name changed to Huntmaster in what one forumite says was 1974, but I can’t say for sure. What I can say for sure is that these seats are holy crap amazing. Look at that pattern! It’s the most ‘70s thing I have yet seen. These are extremely rare, in any condition, but these are in very good to excellent condition. ONe recliner knob is broken, and there are a few thread pulls on the fabric, but for seats of this vintage (early 70s, likely) they are amazing. The drivers seat is a bit narrower than the passenger seat (or vice versa I suppose) - I am 5; 8" 165lbs, and the bolsters are just snug on my ribs. I suspect they could be bent out a bit, but I haven’t done it on these so can’t guarantee. The wider seat has plenty of extra room for me. Colors are black on the bolsters, and the centers are tan, orange, a reddish orange and brown. What is not mentioned in this ad is that these seats have a bit of an interesting provenance beyond their rally connection: Star Wars. So here we have a seat that’s tied together with vintage rallying, the ‘70s aftermarket, Star Wars and laid out in the coolest seat pattern I have seen in a long time. If there’s a better seat, I haven’t found it.